The question is sometimes asked as to why the Gospel tradition was ever written down in the first place. Writing may have obvious advantages to those of us who live in Gutenberg’s world, but some contend that those living in largely illiterate cultures where orality dominates would have felt differently. This came up yesterday in the NT seminar here where Chris Keith was presenting an interesting paper on the reading of the Gospels in early Christian worship services. During the Q&A, he mentioned that it remains a real question as to why Mark decided to write an account of the Gospel in the first place. The oral tradition had been humming along nicely up to that point, so why the need for a new form? A listening situation is defined by three constraints: (a) listeners cannot determine the time of communication; (b) they do not control the rate of delivery, but are dependent on the pace chosen by the storyteller; (c) they cannot backtrack and choose to review content that particularly interests them, but must follow the thread of the narrative, which is necessarily linear because it is inscribed in time. If you add a concern for a connection with eyewitnesses, then a written narrative of the Gospel seems near to an inevitability. Obviously there are distinct advantages of oral communication over against written, but I still find myself unsurprised that the Gospel story was “textualized” as the nascent Christian movement matured and spread. Beginning 01 August 2016, the research projects coordinator of the Scholars Initiative, located in Oklahoma City, OK, will coordinate with the executive and associate director to plan, implement and support collaborative work on innovative research projects, which advance the museum’s commitment to “invite all people to engage with the Bible through … scholarly pursuits.” In particular, the programming of the Scholar’s Initiative fosters research projects in which scholars include outstanding students in rigorous research projects relating to the languages and material culture of the New Testament and Hebrew scriptures. 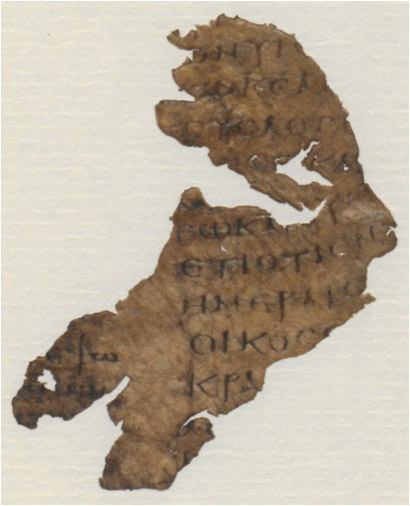 The Scholars Initiative has previously organized collaborative research projects on Greek papyri from the Roman era, Dead Sea Scroll fragments and Medieval Latin manuscripts. Most recently, projects exploring the nature of the Old Greek tradition of the Psalter and the Greek minuscule tradition of the Pauline Corpus have been developed, with programs on Syriac patristic texts and the Lollard movement currently in active development. Where appropriate, participating scholars will publish their findings within a Brill series dedicated to the artifacts and research interests of the Museum of the Bible. Pay and benefits are competitive. Candidates may submit a coverletter and CV by email to Mrs. Molly McCloud, manager of human resources (molly.mccloud@mbible.org) The coverletter should be addressed to Dr. Michael Holmes, executive director of the Scholars Initiative. Please provide contact details for three references. References and further materials will be requested from shortlisted candidates. Review of candidates will begin immediately and continue until the position is filled. Please direct any questions to Dr. Christian Askeland (christian.askeland@mbible.org). There are some incredible designs in this micrography. Here is Psalm 119 in the Sana’a Pentateuch. For more on micrography, see Illuminating in Micrography by Dalia-Ruth Halperin (Brill, 2013). Competition for awards to be given at the Eleventh International Congress of Coptic Studies, to be held in Claremont, California (U.S.A.), 25–30 July 2016. The International Association of Coptic Studies will award two prizes, one for the best M.A. thesis and a second one for the best Ph.D. dissertation, both written in the field of Coptic studies. Winners will receive a certificate and an amount of €2,000 (Ph.D.) or an amount of €1,000 (M.A.). Eligible theses and dissertations should make a significant scholarly contribution in the field of Coptic studies in the widest possible acceptation, in accordance with the objectives of the IACS. Eligible for the current competition will be M.A. theses and Ph.D. dissertations accepted by any recognized academic institution in the four-year period 2012 through 2015. By “acceptance” is meant the date of the formal approval of the thesis/dissertation by the responsible faculty; it does not mean the date of submission or the date on which the resulting degree was ceremonially conferred (as at a graduation ceremony). Competitors for the prizes are requested to submit a .pdf version of their thesis/dissertation before 15 May 2016 to the President-Elect of the IACS, Prof. David Brakke (email, it is not necessary to submit also a printed copy). Submissions should mention clearly the full name and contact information of the author of the thesis/dissertation, and they should be accompanied by a copy of the diploma (or other proof that the thesis/dissertation has been formally accepted by a recognized academic institution) and a brief letter of recommendation from a thesis/dissertation supervisor. The thesis/dissertation may be written in any of the four “congress languages” recognized by the IACS (English, French, German, Italian). Submissions will be judged for clarity and correctness of expression, conceptual and methodological adequacy, originality, as well as general quality and interest; for Ph.D. dissertations, also methodological innovation will be a criterion. The jury will consist of the Board of the IACS, which may call in specialist advice if necessary. Finally, the book from the Pericope of the Adulteress Symposium is out (see here), and I am happy to have contributed with a chapter, “The Strange Case of the Missing Adulteress.” This is an expensive book, but a more affordable paperbook will be published in due course. Read more about the book on Larry Hurtado’s blog. On behalf of the editors, I asked Larry to write a response chapter and I am glad that he accepted to do it. 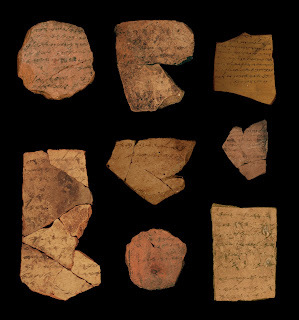 Scholars debate whether the first major phase of compilation of biblical texts took place before or after the destruction of Jerusalem in 586 BCE. Proliferation of literacy is considered a precondition for the creation of such texts. Ancient inscriptions provide important evidence of the proliferation of literacy. This paper focuses on 16 ink inscriptions found in the desert fortress of Arad, written ca. 600 BCE. By using novel image processing and machine learning algorithms we deduce the presence of at least six authors in this corpus. This indicates a high degree of literacy in the Judahite administrative apparatus and provides a possible stage setting for compilation of biblical texts. After the kingdom’s demise, a similar literacy level reemerges only ca. 200 BCE. Our algorithmic sequence consisted of three consecutive stages, operating on digital images of the ostraca (see Supporting Information). All of the stages are fully automatic, with the exception of the first, which is a semiautomatic step. Extraction of characters’ features, describing their different aspects (e.g., angles between strokes and character profiles), and measuring the similarity (“distances”) between the characters’ feature vectors. The important thing is that the computer software has to have “binary” images in step two. This seems to mean that the computer needs a crisp black and white image with just the letter and nothing else. But that means reconstructing letters from pottery that’s worn, dirty, scraped, etc. (see photo below). That’s the stage I have some doubt about since the handwriting algorithms work by measuring distances between vectors (see step 2 above). 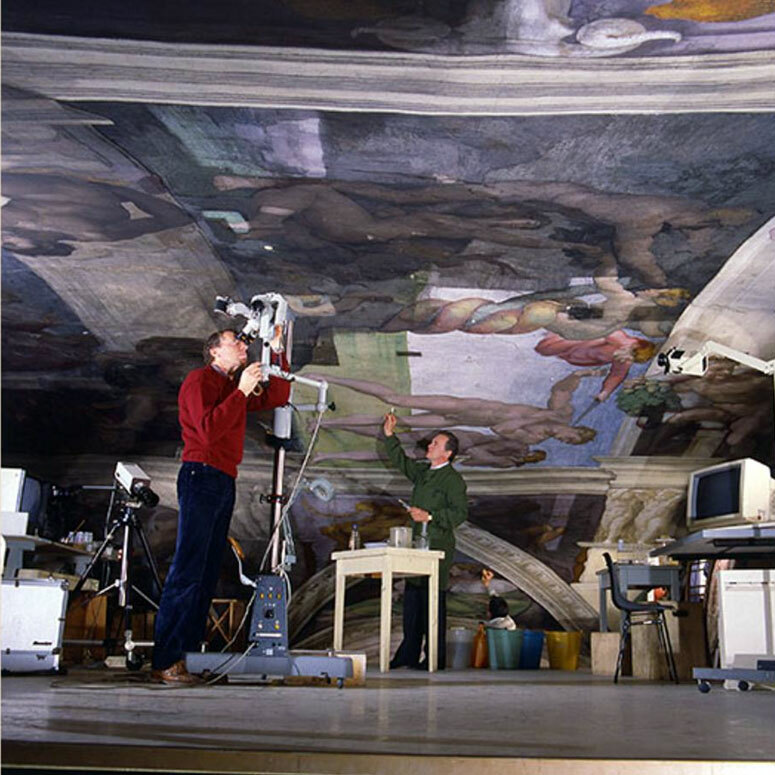 Depending on how sensitive those measurements are, the reconstruction process could make a big difference. Visual representation of the process of restoring lost letters. The authors did test the method on 18 modern Hebrew writers and it worked in about 98% of the cases. That’s impressive. But then they didn’t have to reconstruct their handwriting either since they had nice, clean scans of alphabets the 18 people wrote for them. Still, I did find the handwriting analysis itself most interesting. I’d like to see the method applied to something like the correctors in Sinaiticus and see what it comes up with. It is a good time to be a student of American religious history and especially American Evangelicalism. Historians like George Marsden, Mark Noll, Nathan Hatch and others continue to write incisively on the subject even as a younger generation follows in their wake. 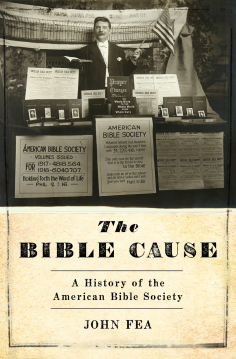 Just recently, a number of fine historians of American religion have turned their attention to the story of the Bible in America. Not that there haven’t been others, but each of these stands out in one way or another from previous works. 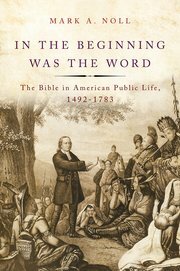 The most notable of the recent bunch is Mark Noll’s first volume of a projected two volume history of the Bible in American public life. I can’t think of anyone better suited to write this story. Noll has been writing about American Evangelicalism for decades and along with George Marsden is considered the dean of American religious history. I have yet to be disappointed with anything Noll has written and I would venture that this new book will overshadow his acclaimed America’s God. Sadly my copy had to be shipped to the U.S. where it is eagerly awaiting my return. In the end, it is precisely this capacity for self-criticism that distinguishes Noll’s In the Beginning Was the Word as the most profound treatment ever written of the Bible in American public life. All too often, histories of the Bible in America have uncritically glorified the American project, stopping just short of assuming that Moses and Jesus were Americans whose teachings were everywhere in harmony with the nation’s imperial ambitions. Noll exposes this delusion while also admitting the illusory nature of the sola scriptura that forms part of his own heritage as a Protestant. Yet Noll’s book is not all criticism. In its own nuanced way, it is a celebration of the richly fertile biblical world that colonial Americans inhabited. I have been unable to do justice in this review to the sheer volume of biblical allusions and citations that Noll uncovers in the legions of sources he examined. As he explains in the book’s introduction, his referencing of so many passages of Scripture was a conscious decision—an answer to his colleagues in the historical profession who have treated the Bible as mere “wallpaper, simply a backdrop for more important objects of attention.” To be sure, as Noll’s own account makes clear, the Bible has sometimes functioned as little more than rhetorical wallpaper, a fancy covering designed to sanctify the nation’s aims. But the Bible has also proven personally ennobling for countless citizens, even—and perhaps especially—after the republic threw off the system of inherited nobility and monarchy in the wake of the Revolution. Noll promises a second volume that will examine the “rise and gradual decline of a ‘Bible civilization’ in the United States in the long 19th century.” After the intellectual feast Noll has already given us over the course of his career, including in his earlier magnum opus, America’s God: From Jonathan Edwards to Abraham Lincoln (2002), we can only rejoice that the world does not yet “contain [all] the books that should be written” (John 21:25) by this uncommonly wise interpreter of the American religious experience. Second up is John Fea’s new institutional history of the American Bible Society which should be of special interest to those of us who read the Bible in a UBS edition. As Scot McKnight puts it, “Every major translation of the Bible today translates the Hebrew and Greek texts produced in conjunction with ABS and UBS. This alone justifies the importance of knowing the story told by Fea.” Interestingly, Fea was commissioned by the Bible Society and agreed only on the condition that he would have full academic freedom. He says that “in the end, I am not sure some folks at the ABS understood the difference between a scholarly history and a promotional piece” (his book being the former rather than the latter). As the ABS observes its 200th birthday, it has become more clearly aligned with a broadly defined evangelicalism than it has been for a century. That adjustment has been both self-conscious and controversial among the ABS leadership. ABS leaders have also become concerned that the agency has, for too long, focused simply on shipping as many Bibles as it can... Especially in America, the Bible remains pervasively owned, but little read, except among a devout minority. With the advent of the Internet and smartphones, access to the Scriptures in physical or electronic form is no longer an issue for much of the world’s population. The problem is focusing a prospective reader’s attention (or what the ABS calls “engagement”) on the Word of God. No study of the Bible’s influence in America would be complete without some consideration of “America’s theologian,” Jonathan Edwards. 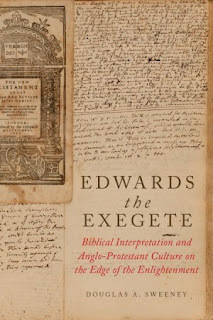 After a swell of interest in Edwards’s theology and philosophy over the last thirty plus years, Edwards is finally being studied at length for his contribution to Biblical interpretation. Other contributions have tackled his interpretation of specific portions of scripture (e.g., the Psalms or Revelation), but this book’s aim is much more comprehensive in setting the great Puritan’s exegesis firmly in its historical context. As Sweeney shows, throughout Edwards’ life the lion’s share of his time was spent wrestling with the words of holy writ. After reconstructing Edwards’ lost exegetical world and describing his place within it, Sweeney summarizes his four main approaches to the Bible—canonical, Christological, redemptive-historical, and pedagogical—and analyzes his work on selected biblical themes that illustrate these four approaches, focusing on material emblematic of Edwards’ larger interests as a scholar. Sweeney compares Edwards’ work to that of his most frequent interlocutors and places it in the context of the history of exegesis, challenging commonly held notions about the state of Christianity in the age of the Enlightenment. 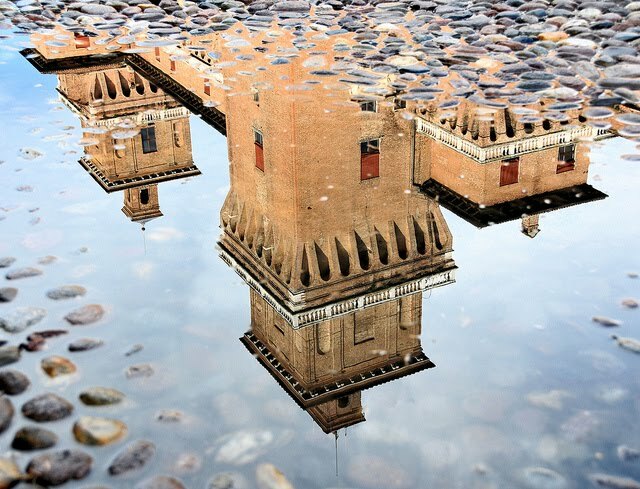 This summer the Department of Humanities at the University of Ferrara (Italy) will again be offering an eight day summer school on textual criticism. Attendance is capped at 14 which means there should be plenty of personal attention. The first week will be taught by Paulo Trovato whose book I have mentioned before on this blog. The second week includes a list of invited lecturers who will be covering specific textual traditions and their unique problems. This year I will be be teaching the slot on the New Testament with a special focus on the CBGM. There is also time for students to share their own research. It’s a great opportunity for NT students to get a much broader view of textual criticism. The problems and solutions from other textual traditions can often be very illuminating. I am very much looking forward to hearing the other speakers present. And then, of course, there’s the gelato. The course is aimed at both graduate and PhD students (max. 14 people) in diverse disciplines who would like to improve their knowledge in the field of Textual Criticism and discuss their research topics with colleagues and teachers. The basics and current theories, as well as the presentation of individual research subjects will be covered in the first 4 days. Further days will be spent deepening particular aspects of Textual Criticism, both in modem and classical languages, with particular attention to more recent developments, and discussing individual research. On Saturday and in some afternoons free guided visits and tours in medieval and Renaissance Ferrara are scheduled. Among the programme teachers you will find Joydeep Bagchee (Freie Universität Berlin), Dario Bullitta (Siena), Paolo Chiesa (Milano), Peter Gurry (Cambridge), Francesco Stella (Siena), Elisabetta Tonello (University e.Campus) and Paolo Trovato (Ferrara). For further information and application form see our website or contact the Director of the Summer School: Professor Paolo Trovato at trp@unifc.it subject: SUMMER SCHOOL. The Islamic Manuscript Association, in cooperation with Cambridge University Library and the Thesaurus Islamicus Foundation, is pleased to announce an advanced short course in manuscript studies, entitled Scholars, Scribes, and Readers: An Advanced Course in Arabic Manuscript Studies, which will be held at Cambridge University Library from 6 to 10 June 2016. This intensive five-day course is intended for researchers, librarians, curators, and anyone else working with Islamic manuscripts. As an advanced course, it is particularly aimed at those who already have some experience in Islamic codicology and palaeography and all participants must have a good reading knowledge of Arabic. 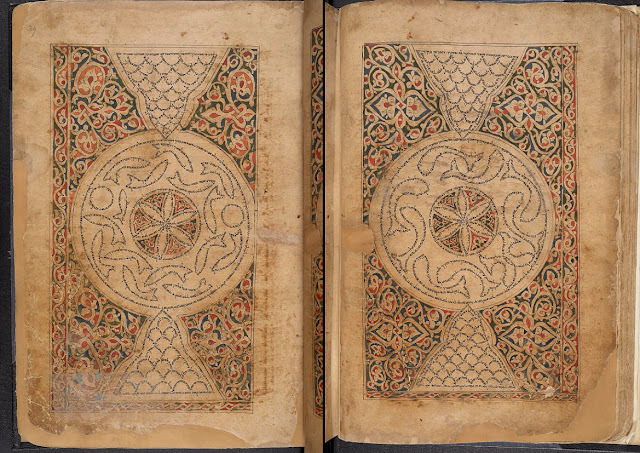 The course will focus on Arabic-language manuscripts from various regions, including historical Turkey, Iran, and India. It is hoped that this advanced course will allow participants to gain greater exposure to and familiarity with the vast array of practices encountered in Arabic manuscripts. The workshop will consist of three days of illustrated, interactive lectures on selected manuscripts and two days of hands-on sessions focusing on a selection of manuscripts from the Cambridge University Library collection. The manuscripts selected for presentation by the instructor cover the whole range of scribal practices encountered in a variety of subjects/genres, geographical regions, and historical periods (see the programme for details). The course will be led by Adam Gacek, a retired faculty lecturer and former head of the Islamic Studies Library, McGill University, who is the author of a sizeable corpus of publications on Islamic manuscripts, including The Arabic Manuscript Tradition: a Glossary of Technical Terms and Bibliography (2001, 2008 - Supplement), and Arabic Manuscripts: a Vademecum for Readers (2009). An interesting little parchment fragment (5.4 x 4.8 cm) of Ezekiel, which is (acc. Papathomas) comparatively not very well attested among the papyri and parchment from Egypt. The reconstructed page is c. 17cm (high) and 11-12 cm (wide) with two columns (3.5-4.0 cm wide each) - so unusually small for a two column codex. There is one clear nomen sacrum (see in the photo above in line 2). My favorite question that gets at the heart of the matter is the one asked by Paul Eggert: “If the Mona Lisa is in the Louvre, where is Hamlet?” (Securing the Past, p. 215). We could just as well ask, “If the Mona Lisa is in the Louvre, where is the Bible?” It seems to me that textual criticism of the Bible is an attempt to answer the latter question. Tommy Wasserman, Review of Texts and Traditions. Essays in Honour of J. Keith Elliott, edited by P. Doble and J. Kloha (pp. : 219–226). Abstract: Modern critical editions enclose Matt 21:44 in brackets due to lingering questions about whether the major witnesses have preserved an early scribal assimilation to Luke 20:18, as it is not present in many Western witnesses. 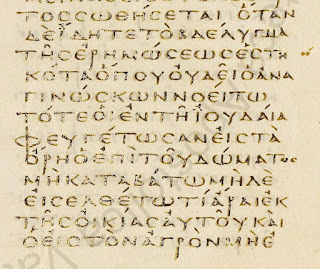 Due to the challenge posed by papyrus discoveries to such “Western noninterpolations” in recent decades, many scholars now tend to favor the authenticity of this verse in Matthew and reject the assimilation hypothesis along with most other shorter Western readings. 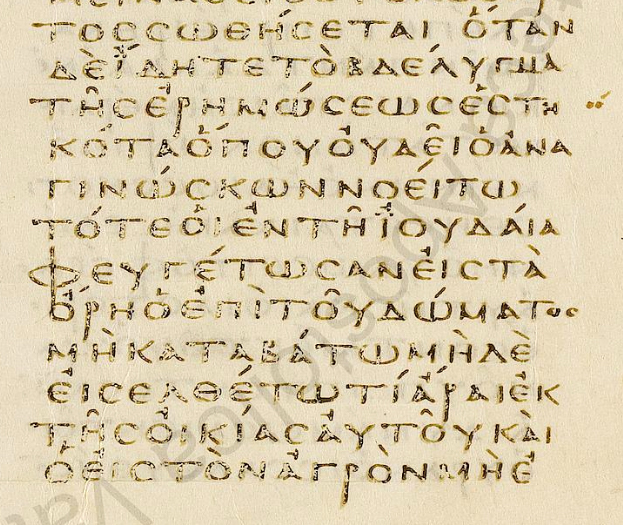 This particular text, however, has rarely been studied thoroughly, and recent treatments have not fully dealt with the implications of the second-century fragment 𝕻104 (P.Oxy. 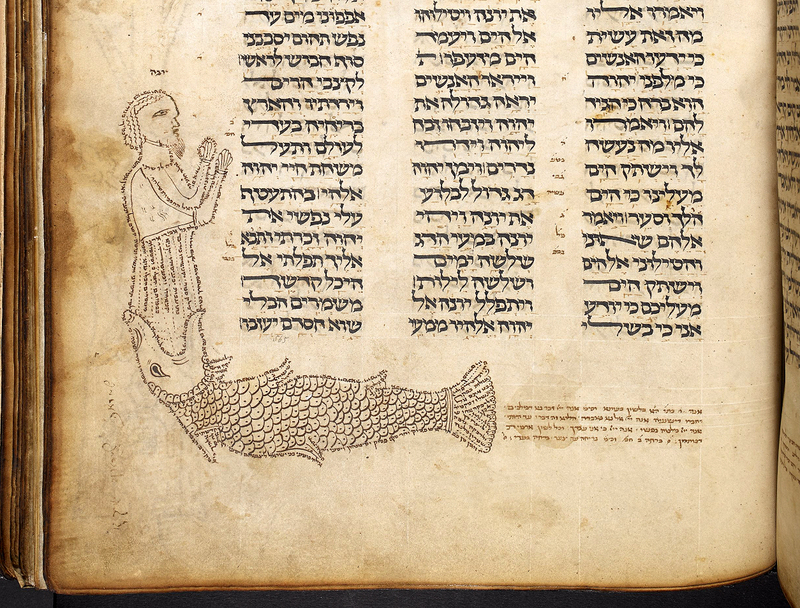 XLIV 4404), which appears to lack the verse. This article presents a comprehensive study of the text’s external and internal evidence and argues that it is best explained as an early scribal assimilation by (1) providing a detailed transcription of the papyrus that corrects errors in prior versions, (2) presenting new quantitative data on assimilation tendencies among major witnesses, and (3) responding to the internal arguments for the longer reading. Abstract: Job 30:24 is a notorious crux interpretum. Understandings of this verse which are typically offered cannot be anchored in the text and appear to be too simplistic for the Jobian context. If it is recognized that a scribal confusion might have occurred because of the possible ligature הנ = ות a cogent text can be obtained, which can be paraphrased: “God would not destroy completely (cause the death of) a person, if that person sees in such calamity his deliverance.” This deep insight serves as the logical foundation for the concluding “protestation of innocence” in Chapter 30. Job, who has been ruined and who sees in death his salvation, must be considered a man of fortitude, integrity, and honesty and his words unquestionably believable and acceptable. His drive for restitution, according to the Doctrine of Retribution, should be heard.